The times when APIs were limited to technical domains have passed without a trace. Nowadays companies, which understand how to implement APIs, benefit largely by cutting costs and improving efficiency. APIs allow to monetize data, make profitable deals, and discover new pathways for innovations and growth. According to the recent McKinsey analysis, the amount of APIs is estimated to triple during the next year. Nevertheless, we observe just a few companies holding mature API programs right now. Apart from the early adopters, rarely an average businessman realizes the value an API strategy may create. Being unaware of these opportunities leads to lost focus and missed perspectives. Therefore, we suggest shedding light on the ways APIs may advance your business. APIs are the connective tissue of today’s ecosystems. As long as the business is moving mobile, social and into the cloud, API’s ability to standardize the functionality is extremely relevant and helpful. APIs allow to access data and connect systems easily and quickly on a regular basis. Thus, IT systems produce better results thanks to the simplified back-end: speed improvement and automated tasks. APIs are the technological asset to designing an innovative and engaging ecosystem. The above-mentioned McKinsey report states global economic growth by over $1 trillion provided that the revenues are redistributed across sectors and ecosystems. This turns APIs into a significant competitive advantage. Due to its connective nature, developers can create an enriched customer experience as well as link organization and technologies. Through providing constant data aggregation and on-demand reporting, APIs help deliver a highly personalized product in numerous industries, such as healthcare, finances, media, entertainments, eCommerce, etc. A shortlist of functionality you get using APIs include leveraged integration, user authentication, credit approvals, fraud management, tracking subscriptions, and many more. APIs are forecasted to upgrade the digital wallet payments and enable machine learning to provide more sophisticated operations and more advanced conversational capabilities. How can you take the most out of using APIs? APIs can generate massive value only if you understand where best they can be applied. For that, market leaders usually first analyze how the value might be created or destroyed, then form a definite strategy and size the forecasted benefits. More precisely, everything begins with looking over the current customer journey for potential API opportunities. Further, the business and tech professionals brainstorm and come up with the possible solutions. Once the best opportunities are identified, developers select the APIs which can unlock the true value. The next step is to get these APIs. Understanding what it takes to develop an API requires an in-depth knowledge of the data environment, particularly of the back-end system. 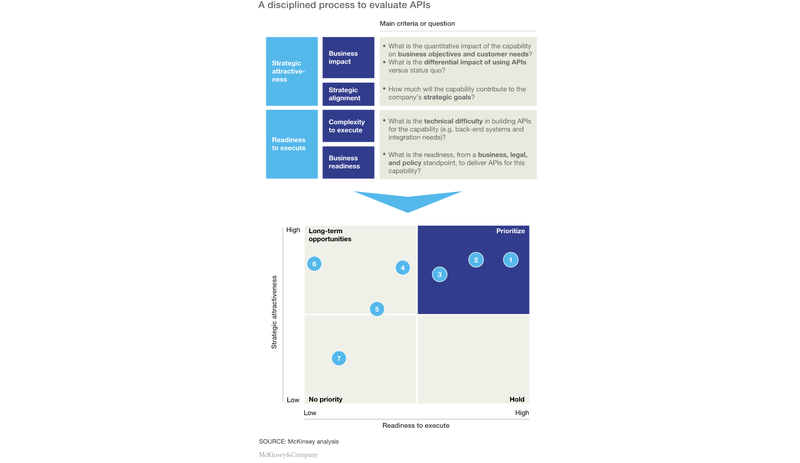 The prioritization matrix by McKinsey & Company can be of immense help. Replying to the set of questions will clarify the strategic value in regards to the technical, privacy, security, and regulatory concerns. There are cases when it is rather rational to hire externals to design the API or purchase a ready-built solution. Note that the value doesn’t necessarily suggest building something new. Multiple cases prove that businesses improve their functionality by using third-party APIs as well as by adding new features to the existing products. If you are a B2B SaaS solution provider, you have undoubtedly realized that one of the market must-haves is to provide a smooth integration with clients. This is the very right place where APIs can create enormous value. Building and maintaining integrations with numerous shopping carts and marketplaces requires an unfairly huge amount of time and money. Not only does it unfocus the company from improving the core product, but also needs investing many resources on a constant basis. In this case, a ready-built solution would fit into the growth strategy seamlessly. API2Cart is a unified API which allows you to connect to over 35 shopping carts and marketplaces without any coding. You can contact us for more details or test how it works on live stores.